NTSC Region 0 - for world-wide enjoyment! In this 7 DVD box set, Maya takes you on a journey of self-discovery through your Chakras. In Courage, Creativity & Willpower, Maya introduces you to the "lower triangle", introducing a new Kundalini Yoga practice for each individual chakra. In Love and Truth, you are guided through the practices for chakras 4 & 5 - the heart and throat. In Wisdom & Bliss you complete your journey as Maya guides you through the Kundalini Yoga practices for Chakras 6 and 7. These upper Chakras correspond to the subtle realm. Chakras are energy centers which absorb life force or prana from the Universe, and are distributed through the body's energy channels, or nadis, to the nervous system, endocrinal glands and circulation system. The chakras of the lower triangle focus on elimination and are balanced by those of the upper triangle which accumulate, create and refine. Just like a tree, if the root system is functioning properly then the leaves begin to grow and flourish. By opening and balancing the chakras it is possible to connect to a much larger source of energy, that from which we come and to which we return. The first five chakras are associated with the elements (or tatvas) of earth, fire, water, air and ether. The upper chakras correspond to the subtle realm. 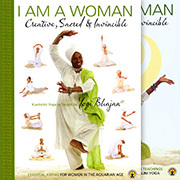 Maya Fiennes is a wonderful teacher and with these DVDs you will obtain an excellent Kundalini Yoga experience, both at the physical and spiritual levels. She incorporates mudras, mantras, and meditations and each step is clearly explained. The exercises are good for students at all levels, and you will really enjoy her music.